Routine stuff | Carnahan & Sons, Inc.
No rain yesterday, and the days are warming up. Today’s temp is predicted for 93F (34C). The talk around is about the heat and humidity. I won’t disagree, but why do we seem surprised that the temperatures are hot? After all, it is almost July, and we are in SWIN. We haven’t hit 100 yet, but the talk is about the ‘humiture’, or the ‘feels like’ temperature, which will be over 100 today. I guess we are creatures that have grown dependent on our A/C, and I gotta admit, I do like being in the office today, not out on the Gator. There have been some routine tasks this week: Spraying ditch banks and roadsides from the Gator has been one of them. Brandon has been concentrating on getting the machines cleaned from wheat harvest. 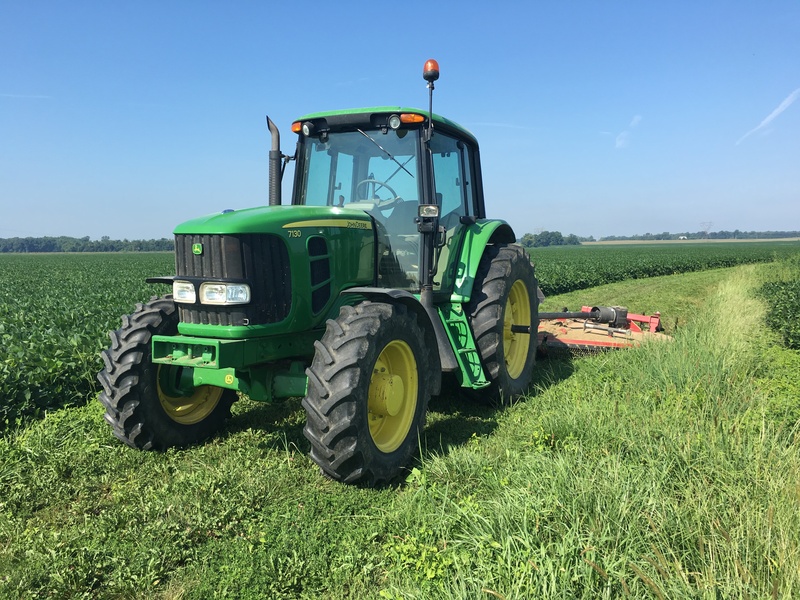 He used the JD Z970R mower all around the farmstead, and down the lane this week. Looks great. We mow about 6-7 acres to keep the place looking good. The rainy spell is delaying our return to the needed fields for the little bit of soybean replant that we’re hoping to do. Nick from Hutson, Inc. has been here a couple times to diagnose a data problem we’re having with the Gen 4 screen in the 9520R tractor. Even though we captured the soybean planting information in the Climate.com FieldView system (which merely “listens” to the Greenstar system), we are not finding the as-planted maps in JD’s Operations Center. Interesting. We’re hopeful that Nick will have assistance from JD corporate, and that he will find a way to make it work. Upon inspecting the ‘stand’ of the double-crop soybeans (DCB) planted in the wheat stubble: not too bad, but I may have to return to some spots to replant. I had adjusted the ground pressure on the drill, and may have had it too low to cut through the little spots of heaviest straw. I’ve been planting with this type drill for I don’t know how many years, but I still have stuff to learn! Mowed the yard yesterday. This is the kind of stuff that occupied our week. 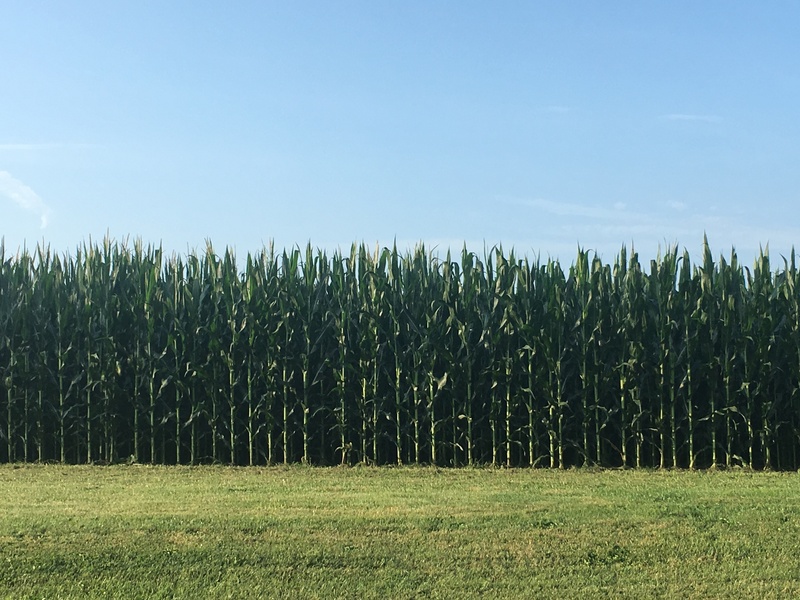 We are grateful for the health of the corn crop, and it is now moving into full tassel. Really, it looks pretty good right now. The soybeans, too are growing well, and the fields are pretty clean of weeds. John has managed well the dicamba applications and he is thinking he will only have to return to those fields where johnsongrass spikes through next month. A little Roundup will clean that right up. This corn field surrounding our yard is looking pretty nice this morning. And the smell is sweet, too! Next week, after July arrives, the bush hog will move into service, making more riparian filter strips and roadsides look ‘cared for’. Ross says he plans to move out some of the wheat next week. The county fair is a couple weeks off. July brings a time when we can usually have a more normal workday existence. I’ll spend several July days mowing waterways, roadsides, and riparian areas with the 7130 and bush hog. So, we hope you have a good weekend. I’m not sure exactly what we’ll be doing next week on the 242nd birthday of the USA, but I’m hoping that beef on the gas grill and potato salad are included! This entry was posted in Family Life, Harvest, News and tagged bush hog, FieldView, Gen 4, heat and humidity, humiture, Hutson Inc, Independence Day, JD 9520R tractor, JD Gator, Operations Center. Bookmark the permalink.